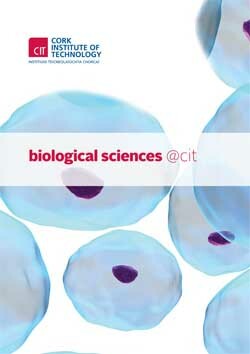 The Department of Biological Sciences offers courses in a number of areas including applied biosciences, biomedical..
CIT's Department of Biological Sciences has always been one of the premier providers of biology related courses in the country, and we look forward to training the next generation of future biologists. Detailed information and up to date news, please click here. All our courses are designed to be career focused ensuring each graduate is equipped with the necessary skills to maximise their employment potential. We place a great emphasis on training biologists for real world positions. With this in mind, we incorporate significant practical content into all our courses. Additionally, in 3rd year, all our students participate in a 16 week work placement programme based in a relevant scientific industry or company, either locally or internationally. Consequently our graduates have a distinct advantage when applying for full time positions.